Mythili Raman, the Justice Department’s top criminal attorney, is leaving the agency next month following high-profile cases of corporate misdeeds, Reuters reports. 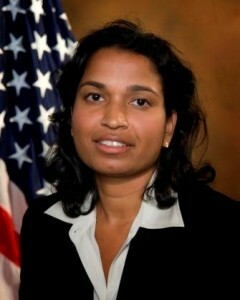 Raman is a 17-year veteran of the department and once acted as chief after her predecessor, Lanny Breuer, stepped down last year. Raman said she’s not sure what’s next in her career. A Senate panel today is expected to consider Breuer’s replacement, Leslie Caldwel, a former federal prosecutor who helped prosecute Enron Corp.
Posted: 2/27/14 at 9:33 AM under Milestone, News Story.